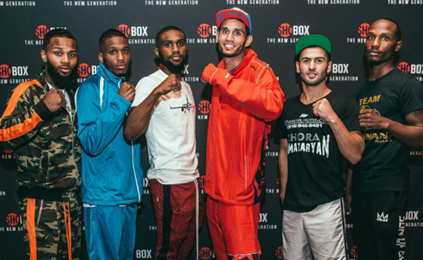 SLOAN, Iowa (July 19, 2018) – Undefeated welterweight prospect Jaron Ennis and fellow unbeaten Armando Alvarez made weight on Thursday for their 10-round main event matchup tomorrow/Friday on ShoBox: The New Generation live on SHOWTIME® (10 p.m. ET/PT) from WinnaVegas Casino in Sloan, Iowa. Ennis (20-0, 18 KOs), a former National Golden Gloves Champion, is a highly-touted prospect from Philadelphia taking a major step-up in opposition against Alvarez (13-0, 7 KOs), who has knocked out six of his last seven opponents. Ennis, who has knocked out his last 10 opponents, will make his television debut in Friday’s main event. Undefeated lightweight prospects Thomas Mattice (12-0, 10 KOs) and Zhora Hamazaryan (9-0, 6 KOs) will meet in the eight-round co-feature. Mattice returns to ShoBox for the second time after debuting on the series in February. Hamazaryan faces Mattice in only his second fight in the U.S. The Armenian native, who calls former IBF Junior Welterweight Champion Sergey Lipinets a sparring partner, won his U.S. debut in February against the previously unbeaten Sergio Ramirez. In the opening bout of the telecast, undefeated super lightweight prospects Montana Love (11-0, 5 KOs) and once-beaten Kenneth Simms Jr. (12-1, 4 KOs) both return to the series when they face off in an eight-round clash. Love returns to ShoBox for the second time and Simms will fight for the third time after losing his undefeated record on the series a year ago. The two meet again after facing each other as teenagers. “Since I was little I’ve always felt comfortable in the ring and so relaxed. I’ve been around it for so long, watching my brothers and my dad. Boxing is all I know. “We have a mission to accomplish for the Ennis family. That’s what keeps me grounded. Both my brothers fought on ShoBox and lost so I’m doing this for the family name. “I looked up to Roy Jones and Floyd [Mayweather] and James Toney. I mostly watched Roy; He was my favorite fighter. “The pressure is all on him. I’m the B side and no one is expecting me to win, but I’m coming win. “He is going to use my size and height but he’s a kid. I’m a grown man. I’ll be ready for whatever he has for me. “This is a big opportunity for me and just another step to where I want to be in my career. Being on TV doesn’t affect me at all, not even the lights and the cameras. I love the cameras. I talked a lot during the fight last time and you’ll hear me doing the same thing again. “I’ve sparred with Gervonta Davis and Devon Alexander. For this fight I sparred with Sonny Frederickson. “I know [Simms] is a boxer and is going to try to outscore me and run around a lot but I don’t think he can hurt me. He doesn’t have the power. “I’m a different fighter now. I started working with a strength and conditioning coach ahead of this fight. I sparred with Regis [Prograis] in Houston. This was my first time training in Houston, there is just better training there than in Chicago. GH3 Promotions signs undefeated Welterweight Kenneth Sims Jr.
ShoBox: The New Generation on Friday, Nov. 6, Live at 10 p.m. ET/PT on SHOWTIME From The Downtown Las Vegas Events Center (DLVEC), across from the D Las Vegas in iconic Downtown Las Vegas.